I don't whisper to them, but I have had the same experience as Yukon254, other than the fact that I never catch two at the same set at the same time, since I use a single entrance cubby. 3/32nds snare, no swivel, and a horizontal ridge pole for the cubby. I don't recall ever losing one with that arrangement. They're always wound up tight against the pole with their front feet off the ground. Hopefully spek can put some kind of drawing on here. I have seen his set used before and it works. I have been going try some as I think they have some distinct advantages over the one I use. My is simple......a horizontal pole about 4-feet off the ground with bait in the middle and a snare on each end. I always make them under big spruce so they are protected from the elements. The biggest thing is loop size......guys that are having wolverine bust out or really mess things up are not getting them caught right. They will twist a snare up like anything else but I have caught many right on the ground that you could have reused the snare. The following picture is an example. The snare was set specifically for wolverine as I had seen where he had been visiting the beaver house in the background. You can see the small dead sticks around him are undisturbed.......he died very quickly. I too have only lost one wolverine in a snare. That would be the one I mentioned earlier where I had it set too low on the pole. But by the same token I have had many that have almost twisted completely through the 3/32 cable. But I have killed them deader than a wedge with little disturbance in 1/16" cable...once. It was a set for fox so it was just a fluke for sure. I tie mine off as high as I can when setting on the ground. Their twisting habit shortens the cable and eventually lifts the front feet off the ground. I agree with Dave that loop size is crucial. If they get a front leg through the loop it's not going to end well. Power rams are always an option. than 3/32. They are for sure tough little animals, but I think they just lack the body weight to consistently pull down a 7/64ths or 1/8th inch cable tight enough for the snare to do it's job. An exception to this would be a set where they end up with all four feet off the ground, which is a set that I have never used. wrap around the saw-buck, until they are sucked up tight and then it's all over. Around here you can make these cubbies under a big tree to protect them from snow and use them year after year. We have a lot of eagles so having the bait hidden inside the cubby keeps them from eating it or getting caught. Two of my brothers trap also and we have all used this snare set for over 50 years and it has worked well for us. Yep, that is the set I have seen. The trapper that used it swore by it. This set is IMO likely a lot better than mine because my bait is right out in the open. Will make some this winter. Awesome information gentlemen and thanks for sharing your tips, I appreciate it. Yukon you mention the beaver house. I just had a big teleconference this morning about wolverines with some researchers. Guys , how important are beaver to wolverines in your areas? 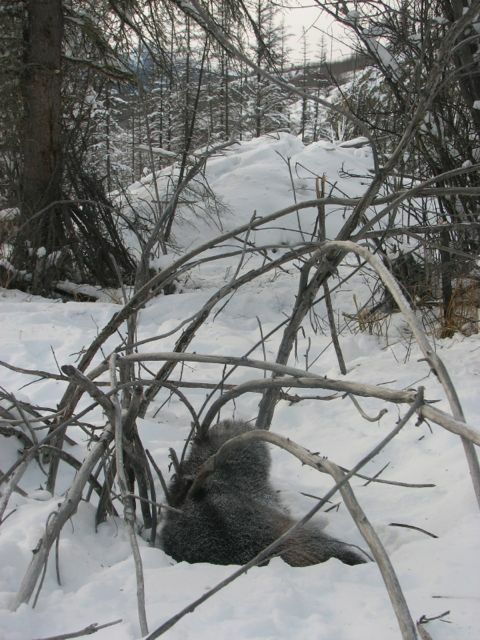 Very little research shows they are a primary food source for wolverines but I think they are in some areas. We're talking about doing isotope work on the hairs to determine their diet over the previous year. We can capture hair both through harvest and passively. I'd appreciate your feedback guys, you know a lot more than any researches I'm dealing with I'm thinking. Well I can't say how many they take of course but they will always go out of their way to get one. I suspect it isn't all that easy. beaver are pretty dang quick on land and usually not far from the water's edge when logging. Unless they were ambushed I think a beaver would escape many times. But to indicate the determination of wolverines and their passion for the meat, I'll tell this story. One fall I was trapping beaver. Late freeze-up so some haul outs were still open. I caught a big beaver in a 330 at one of those spots. An otter found it and tore it to sheds. 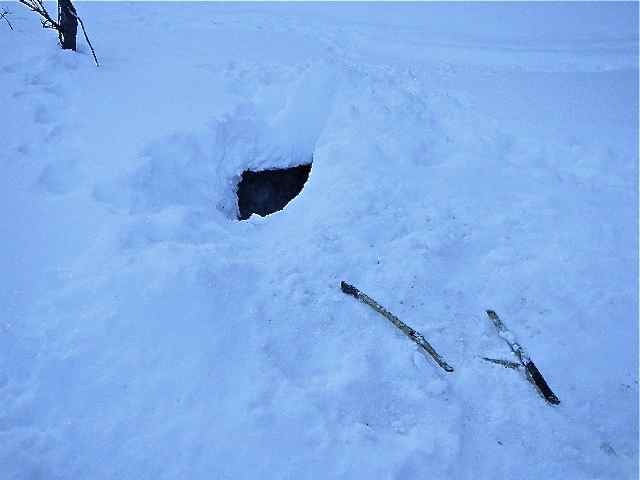 When I got there I salvaged what hide I could and staked the carcass in3 feet of water under the ice edge. Put the 330 completely under the ice thinking to catch the otter. Next day that wolverine was dead as a stone in that 330 completely submerged under the ice. Thats an interesting story Ken. Brian, hopefully you guys will be able to do some research. I think it would be interesting and beneficial. I think it depends on the area. I dont think a beaver would be that hard for a wolverine to catch. Like most of us know in some areas beaver are the primary diet for wolves. I hunted the Beaver river last fall in southeast Yukon. This river was aptly named as the beaver population was incredible, it turned out the moose and wolf population was also very high. Probably the most moose I have seen since I hunted the Halfway river in the 80s. Anyway the banks of this river are high and choked with heavy willows. Just incredibly thick. The wolves were not even interested in moose they were hunting beaver. Every day we would find blood & hair in a run or on a sandbar. There is no doubt wolverine do the same thing in certain areas. They will dig out houses in the winter sometimes as well. Thats why a beaver house is such a good location for a set. This was a small beaver house that a wolverine dug into a couple years ago. I spooked it out of the house and was following its tracks when I came upon this. The beaver here have been hammered by bears and wolves. It's hard to find a live pond anymore. But over all, for this area, beaver has never been a primary food source for wolverine, however they are a supplemental food source. Wolverine are pretty adaptable, so what ever prey is the most abundant at a given time becomes their primary food source. You fellows using climbing sets, figure all wolverines will climb? Well, do you see rejection? If I don't get snow and blow, I see tracks where a wolverine wouldn't work my ground cubbys. I have seen that too but I have a theory that there are some areas where wolverine transit while en-route to another location. I think there are areas where they hunt actively and areas that they do not. I have a spot on my line where I regularly see wolverine tracks. In over 30 years at that location I have never had a wolverine show any interest in a set. But a half mile away I can catch those same wolverine in the same type of set. no. if there are tracks at a set I have either caught the critter or missed it. The rejections I have seen I pretty much attributed to poor bait. To old and dried up with no scent left. And I've never had one look twice at a whole frozen porcupine.